Teens from all over Wisconsin gathered in Black River Falls for the annual Youth Culture Camp from June 18–22. The theme this year was “Living Good Together.” Approximately 70 youth attended the camp this year. 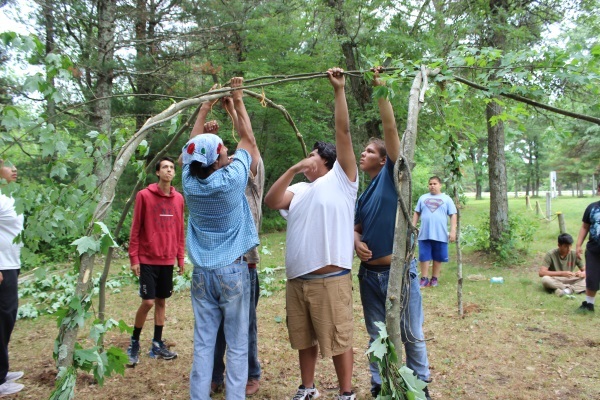 For five days, Ho-Chunk youth gathered to learn more about their culture and heritage. The majority of the culture sessions were held at the new District 1 Community Center with many of the outdoor hands-on activities held at the Powwow Grounds. One of the participants, Aaron Day from Wisconsin Dells, thought it was great. “I thought it was good. There were a lot of good things, yet there are a lot more to be taught. It’s great that they kept us active and not on our phones. “My favorite part of the camp were the lessons with Mr. Preston. We learned what happened to our people in the past, the boarding schools and assimilation,” Day said. He also enjoyed making his own drumstick and then to use it while learning the traditional songs. “It was a good five days . I made a lot of good friends and more bonds. Many feelings were expressed,” he said. Izzy Stacy of Black River Falls also enjoyed the camp. “It was fun. I learned a lot,” she said. Her favorite part was learning to play double ball. This was her first year attending the camp. She hopes to come back again next year. “I made a lot of friends,” she said. Layla Blackdeer of Tomah thought the camp was very educational with many activities. “The whole experience puts you in your place. Someday the youth here will look back to this day and the words spoken here will really have an effect on you,” she said. This is her third year and she hopes to be back again next year. “I liked the elders talking to us from their experiences and what they were taught,” Blackdeer said.